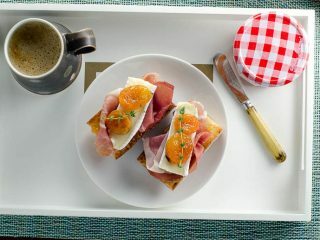 Breakfast in Bed for Mother’s Day or Easy Appetizer Idea? You decide. Looking for a breakfast in bed recipe for Mother’s Day that’s elegant yet easy enough for little hands? 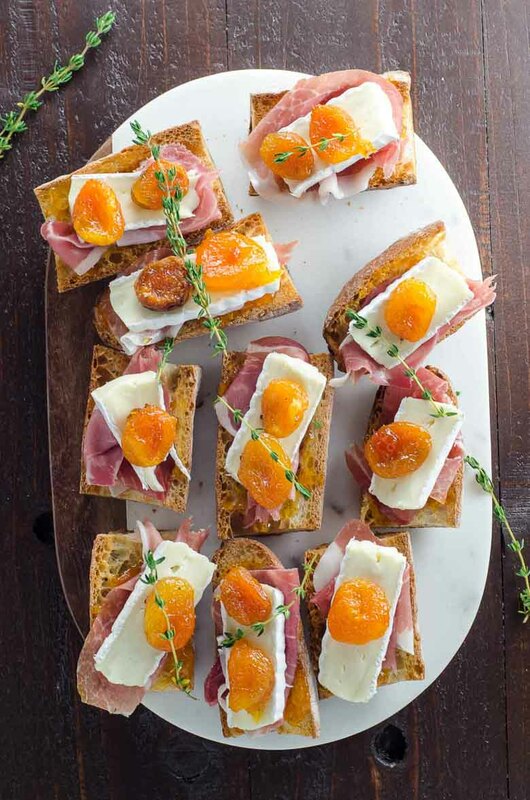 Prosciutto, brie and apricots on toasty baguette will make Mom happy. Bonus: this recipe also makes a fabulous, crowd-pleasing appetizer for your next party. 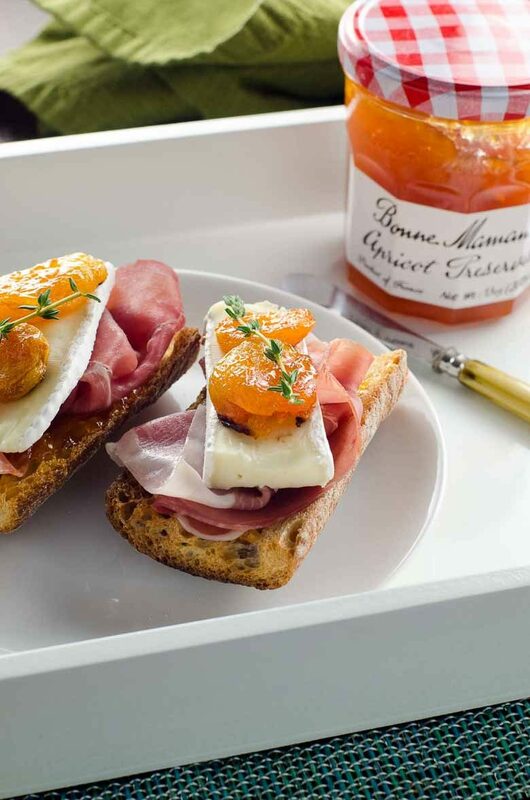 Thanks to our longtime favorite preserves brand Bonne Maman for sponsoring this post, and thanks to you for supporting your partners. Psst...this recipe also makes a great easy appetizer for your next party. Just gonna put it out there that I can’t believe Mother’s Day is coming up so soon. How did that happen? Rhetorical question, to be sure, but our 12-year-old daughter has a theory. As a kid I remember time dragging on endlessly. The months between putting a certain blue backpack on my Christmas list and opening it by the tree was a grueling hundred and one years long. The last two weeks of school each year bled into eternity. I’m guessing that’s not quite the cozy introduction that Bonne Maman expected from this mom of two in advance of Mother’s Day. But it’s a true, and treasured, reflection of my parenting experience at the moment. And such dalliances with the tween thought process make me all the more grateful for the beautiful things in our life that don’t change. Like Bonne Maman preserves. I’m sorry if that’s a little “on the nose,” as they say in London. But it’s true. This elegant recipe is easy enough for little hands to assemble with just a bit of help. It's perfect to serve Mom breakfast in bed on Mother's Day and makes enough for the rest of the family, too. It also makes a great bite-sized appetizer for a crowd if you cut the baguette into thin slices on an angle and finish with smaller amounts of the toppings. Cut the baguette into six sections and halve each section lengthwise. Place sections, cut sides up, in a closely spaced single layer on the pan, leaving some room for the apricots. In a small bowl, stir together two tablespoons of the apricot preserves and the dried apricots until the apricots are evenly coated. Place apricots in a single layer in the remaining space on the sheet pan. Bake for about 15 minutes, until bread is lightly toasted and apricots are a bit sticky and jammy. Spread each baguette piece with some of the remaining apricot preserves. Drape with a slice of prosciutto and top with a slice of brie and a couple of jammy apricots.